Like most people I know, I have a love/hate relationship with Facebook. It all started to go awry when Facebook went public a few years ago. Since then the pressure has been on them to show investors increased revenues. One of the first things they changed was their algorithm. Pages that used to show up in your News Feed - just stopped. They will tell you it's because there isn't enough engagement (likes and comments) on the brand's post. I will tell you that it's because they want Pages to spend money to promote our every post. But, like every obstacle in life, there is a work-around. Take a look at the graphic above to find out how you can once again get posts from Pages you love (ahem). 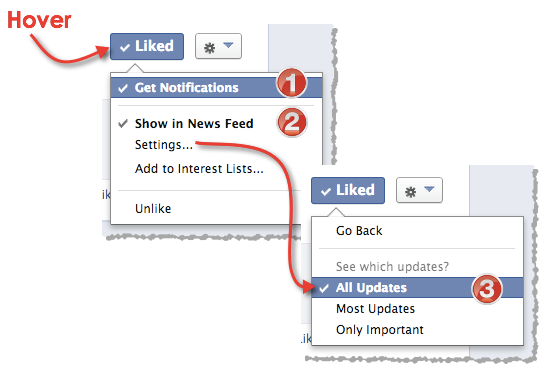 If you just want to make sure Pages are going to your News Stream, click "Show in News Feed"
I wish Facebook would remember that there is a reason you LIKED a Page - because you want to hear about new promotions/contests/etc and get news from the brands you love! I hope this helps to reconnect you to your favorite Pages! If you need help with marketing your business in this new digital age, holler at me. "Creating buzz for brands" is what I do!